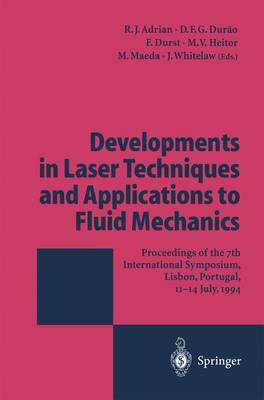 This volume comprises a selection of the best papers presented at the Seventh Interna- tional Symposium on Applications of Laser Techniques to Fluid Mechanics held at The Calouste Gulbenkian Foundation in Lisbon, during the period of July 11 to 14,1994. The papers describe Applications to Fluid Mechanics, Applications to Combustion, Instrumentation for Velocity and Size Measurements and Instrumentation for Whole- Field Velocity and demonstrate the continuing and healthy interest in the development of understanding of the methodology and implementation in terms of new instru- mentation. The prime objective of this Seventh Symposium was to provide a forum for the presen- tation of the most advanced research on laser techniques for flow measurements, and communicate significant results to fluid mechanics. The applications oflaser techniques to scientific and engineering fluid flow research was emphasized, but contributions to the theory and practice of laser methods were also considered where they facilitate new improved fluid mechanic research. Attention was placed on laser-Doppler anemometry, particle sizing and other methods for the measurement of velocity and scalar, such as particle image velocimetry and laser induced fluorescence. We would like to take this opportunity to thank those who participated. The assistance provided by the Advisory Committee, by assessing abstracts was highly appreciated.